I say short-ish since this is short relative to the number of fantastic places to visit / eat / imbibe / shop in San Francisco and the Bay Area. Compiled primarily for my lovely cousin in anticipation of her trip out west, also so that I don’t forget some places that I really like. I’ll keep adding to the list as places occur to me. In no particular order, links listed below. I have most assuredly forgotten a few things, but what do you do. Quick heads up, it’s frequently chilly-ish in the summer because of marine layer / fog. The photo illustrates typical SF summer weather (was taken in July 2009). It tends to be a bit more consistently sunny towards the end of the summer, but it’s still worth packing a sweater or two. Also, be wary of wandering too far in to the Tenderloin if you’re in the middle of town (maybe it’s changed since I lived there? Probably not though…). Bring a big piece of cardboard, or waxed paper if you want to go really fast. Expect to fly well past the landing pit at the bottom. Knee pads wouldn’t go amiss, but safety gear takes all the fun out of things, doesn’t it? Ice cream place in the Mission. Tacos in the Mission + a short walk to check out the street painting and get rid of that ultra-full feeling + scoops from Humphry Slocombe = great afternoon. Szechuan Strawberry is a great sorbet flavor, if they happen to have it when you visit. I’ll be honest and say that I’ve never really heard the organ play even though I’ve visited multiple times. Just some funny belching noises that sound like they may be vaguely musical! Supposedly the tide may have something to do with what you actually hear. At any rate, doesn’t matter, it’s a beautiful, fun spot and has great views. It’s definitely worth checking out the Presidio as well if you’re thinking of visiting the pipe organ, they’re pretty much right next to one another. Great place for a run (and I say that as a non-runner!) with beautiful scenery and views. The Walt Disney Family Museum happens to be there as well, which is neat if you’re in to that stuff. Again with the views. Also, very, very good bagels last I checked (though that was probably pre-2006 when I did a course there… I’ll assume they’re still fabulous!). The cafe has short hours, so double check before you go if you want to get food. The tiled courtyard at the entrance is beautiful and frequently has student exhibitions on. Have seen the parrots of Telegraph Hill roosting in the trees there a couple of times, which is fun (and loud!). A fantastic building, with great rotating and permanent exhibitions. Their biodome makes me feel like a kid in the best of ways, it’s just so neat. NightLife on Thursdays is fun, if you can make it. Open late, music, cocktails, etc. Likewise, Friday nights at the de Young look great. I’ve actually never been to one of these, but I love the museum and the program looks lively. Exceedingly tasty, and most places in SF you’ll be able to find a Philz fairly nearby. A while back I got a cardamom-laced cup that was just wonderful. Every once in a while I throw a few crushed cardamom pods in to my filter coffee and it always reminds me of Philz with the laundrette next door in Castro. Where you can snag a bargain on designer and high-end clothing labels. A lot of the stock are samples and ex-display items, I believe, so there’s a lot of “can’t find it anywhere else at this price” clothing in there. A beautiful space as well, definitely worth checking out. The Headlands Center for the Arts in Marin. Beautiful location, great place, some neat coves to explore if you can find a path down the cliffs to the beach. Could rent a bike and cycle across the Golden Gate, perhaps. 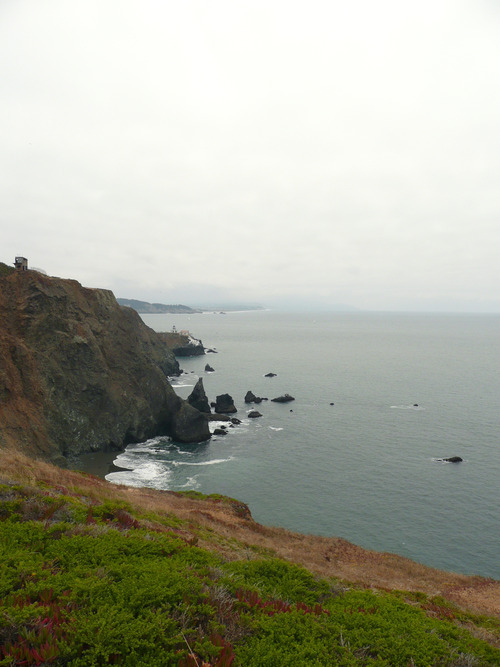 The photo in this post is actually in this area near the YMCA, looking back over Point Bonita towards the west coast of San Francisco. More specifically, if I remember correctly, I think I took it above an abandoned bunker on Mendell Road between Bonita Cove and Rodeo Cove (in case you want to find a path to the beach in the photo, that’s where to go!). So quiet, usually no one there even though it’s so close to the city. Shotwell’s in the Mission. Have always heard great things about this place from people that I really, really like, but haven’t yet had the chance to go. Z. Cioccolato in North Beach. Such. Good. Candy. Magnolia Gastropub and Brewery on Haight St.